Smile Imperfections? Porcelain Veneers in Fort Worth to the Rescue! You’ve lived with the imperfections in your smile long enough and now desire a change, but you’re not sure what’s the best cosmetic dentistry procedure to go with to get the smile of your dreams. Your local dentist says that one of the fastest and simplest ways to mask your flaws and enhance your appearance is with porcelain veneers in Fort Worth. Read on to learn how this process works. Veneers are thin porcelain shells that are custom-made to address such flaws as minor gaps, crowding, crooked and stained teeth. They provide the ultimate in convenience by fitting right over your ivories in the smile zone. Numbing – Your dentist will apply a topical anesthesia before the procedure starts to reduce sensitivity. Enamel Prep – The next step is to remove a thin layer of enamel from your teeth, so that your new veneers will adhere properly. Bite Impressions – After the tooth is prepared, your dentist will then take a series of photos of your mouth and get bite impressions. The information will be sent to a trusted lab that will create your permanent veneers. In the interim, your dentist will fit you with a set of temporary shells. The Final Visit – Once your veneers are ready, your local professional will invite you back to the office for your final visit, where your permanent fixtures will be placed. After this visit, you’ll leave your dentist’s office looking and feeling like a new person! 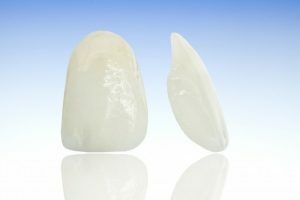 One of the biggest perks of the porcelain veneers process is that it delivers the look of a perfect smile in a fraction of the time that it would take to correct your bite using a more conventional method like braces. Whereas the latter can take more than 24 months to complete, you can totally remake the gleam of your ivories in just two visits to your cosmetic dentist in Fort Worth. Another advantage of wearing veneers is that they are highly resistant to staining. Conversely, they are not designed to accommodate teeth whitening, so if you’re interested in doing that, it should be done prior to having your veneers placed. Thus, you’ll have gleaming ivories to accompany your newly improved dental flaws. Sometimes it’s insinuated that taking your appearance into account is superficial and vein. The reality, though, is that the way you feel about yourself plays a huge role in your overall wellness. That’s because a positive self-image helps to reduce stress hormones that cause inflammation and retard the function of your immune system. Thus, taking the time to enhance your confidence becomes far more beneficial than you may have thought. To experience the power of improving the aesthetics of your smile and feeling better about yourself, reach out to your dentist to schedule a consultation today! A native of the Dallas/Fort Worth Metroplex, Dr. Renee Corbitt graduated from Lamar High School and went on to earn her undergraduate degree from the University of Texas at Arlington. She would then go on to receive her dental degree from the University of Texas Health Science Center San Antonio Dental School. Dr. Corbitt has since gone on to put confident smiles on the faces of her patients for three decades. She can be reached for more information through her website. Comments Off on Smile Imperfections? Porcelain Veneers in Fort Worth to the Rescue!